For this week's 52 Ancestors in 52 Weeks writing challenge from blogger Amy Crow Johnson of No Story Too Small, the theme is Thankful. 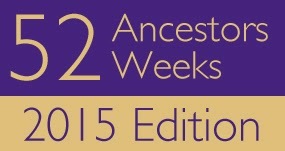 November 26 was Thanksgiving in the U.S. and genealogists think about their Mayflower ancestors at this time of year. Four years ago, I shared the two Mayflower lines that I know of at Mayflower Passenger Ancestors. Only as an adult did I learn the story about my ancestor John Howland falling overboard and almost being lost at sea on his trip across the Atlantic Ocean on the Mayflower. He was born sometime in the 1590s likely at Fenstanton, Huntington County, England, to Henry and Margaret Howland. He traveled on the Mayflower as an indentured servant to Governor John Carver, who died soon after the Mayflower's arrival. In sundry of these storms the winds were so fierce and the seas so high, as they could not bear a knot of sail, but were forced to hull  for divers days together. 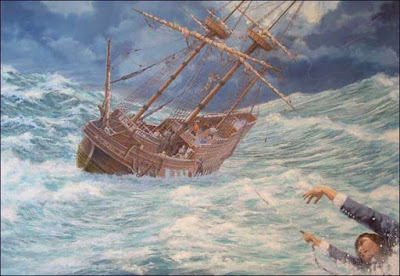 And in one of them, as they thus lay at hull in a mighty storm, a lusty  young man called John Howland, coming upon some occasion above the gratings was, with a seele  of the ship, thrown into sea; but it pleased God that he caught hold of the topsail halyards which hung overboard and ran out at length. Yet he held his hold (though he was sundry fathoms under water) till he was hauled up by the same rope to the brim of the water, and then with a boat hook and other means got into the ship again and his life saved. And though he was something ill with it, yet he lived many years after and became a profitable member both in church and commonwealth. To heave or lay-to under very short sail and drift with the wind. Lively, merry; no sexual connotation. John Howland survived the trip and went on to marry Elizabeth Tilley, another Mayflower passenger whose parents died during the first harsh winter in Plymouth. They had ten children, most of whom had many children. It is said that John Howland is the Mayflower passenger with the most descendants in America today. He died February 23, 1672/3, in Plymouth, having outlived all but one male Mayflower passenger. A perfect post for Thanksgiving. John certainly had much to be thankful for that 1st Thanksgiving. Yes he did! Thanks for reading and commenting! Glad you enjoyed the story. Keep looking for that Mayflower ancestor! Thanks for the comment.